Background: Flail chest occurs when the thoracic wall is compromised secondary to a significant blunt-force trauma, which produces a free-floating segment. This injury is particularly debilitating when sustained on both sides of the chest wall. Despite the severity of this injury, literature regarding the treatment and prognosis of patients sustaining bilateral flail chest (BFC) is sparse. Material & Method: A PRISMA-guided literature search was conducted using Medline, Cochrane, and Web of Science databases. Initially, all studies published in English referring to bilateral flail chest in either the title or abstract were included. Letters to the editor, opinion pieces, and studies pertaining to unilateral flail chest or pediatric patients were excluded. Results: A total of 29 studies were identified. After review of the title, abstract, and body of each study, five met inclusion criteria. One additional study with information regarding bilateral flail chest was later identified and included bringing the total to six articles. Limitations: Limitations of this article are similar to all PRISMA-guided review articles: the dependence on previously published research and availability of references as outlined in our methodology. Conclusion: Recent literature regarding thoracic wall injury has explored the potential benefits of operative intervention in flail chest patients but this approach has not been frequently described for BFC despite the high mortality rate associated with such trauma. Pulmonary complications are commonly found in BFC patients, however there is little published information about this subset of patients as a whole. These injuries have a significant negative impact on the lives of patients and further research is required to gain a better understanding of BFC and the optimal management approaches. Keywords: Flail chest, bilateral flail chest; blunt thoracic trauma; rib fracture; serial rib fractures. Rib fractures commonly occur in the setting of blunt-force trauma. When multiple adjacent ribs are broken in more than one location, a free-floating segment of chest wall is created—thus a flail chest . Historically, flail chest had been managed with external stabilization in an attempt to reduce paradoxical motion of the chest wall . As technology advanced, positive pressure ventilation was increasingly utilized as a means of internal support through “pneumatic stabilization”, and eventually became the main form of treatment for flail chest . In 1975, Trinkle published a study that displayed a major shift in conventional thinking, by citing that pulmonary contusion—not paradoxical chest wall motion—was the primary pathophysiology of these injuries . Recent literature has focused on the potential benefits of operative intervention in unilateral flail chest, however little data regarding management of bilateral flail chest (BFC) exists. Information regarding treatment, associated complications, and prognosis of BFC is sparse and must be inferred from studies predominantly involving unilateral fractures. 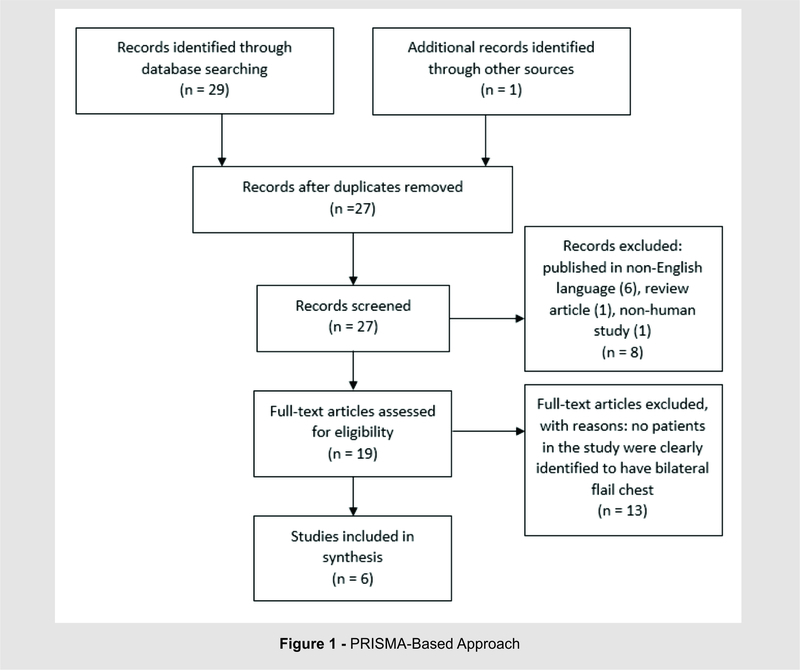 A PRISMA-guided literature search was conducted using Medline, Cochrane, and Web of Science databases. Searches were conducted with medical subject heading (MESH) terms of “flail chest” in Medline and Cochrane, and “trauma” in Medline. Web of Science was searched using “flail chest AND trauma”. Initial inclusion criteria were all articles referring to bilateral flail chest in either the title or abstract. Letters to the editor, opinion pieces, and results pertaining to unilateral flail chest or pediatric patients were excluded (see figure 1). After screening for studies that contained “bilateral” in the title or abstract, a total of 29 potential studies were identified. After examining the titles, abstracts, and content for each, 18 studies were thoroughly reviewed. Of these, five met all inclusion criteria. The diagnosis of flail chest is presumably diagnosed when a floating segment of chest wall is directly observed or when serial segmental rib fractures are evident on chest x-ray or other imaging studies including chest CT. However, a clinically apparent deformity is not obvious in all patients as flail chest injuries may appear later in the hospital course. Management strategies of unilateral flail chest have been reported in the literature for the past several decades. However, the treatment for BFC is often based upon anecdotal reports and expert opinion. Though current literature favors operative intervention for unilateral flail chest injuries, the application of operative stabilization has not been commonly reported for BFC. The majority of evidence regarding treatment of BFC includes retrospective studies. [See tables 1-3] Of the six studies identified in this search, only two were prospective case series, neither of which had a control group. The remaining studies were retrospective—one of which was conducted using database information. The complete absence of Level I and II evidence further emphasizes the need for additional research regarding this injury pattern. Multiple theories exist regarding the pathophysiology of flail chest injuries and how they contribute to subsequent outcomes. Historically, the free-floating flail segment was deemed responsible for an the increased work of breathing with subsequent hypoxemia and decreased vital capacity; this belief was based upon the “Pendelluft” phenomenon, which describes the movement of air between alveoli when regions of the lung differ in compliance or resistance [3,4]. Over time, theories moved away from this original explanation and towards Trinkle’s belief that pulmonary contusion, pain, retained respiratory secretions, and pneumonia are significant driving forces behind the evolution of the condition . More recent literature describes the pathophysiology of flail chest resulting from a combination of respiratory factors and circulatory collapse: decreased lung parenchymal volume produces hypoxia and hypoperfusion, while inflammatory mediators often trigger acute respiratory distress syndrome (ARDS). Specific mechanisms unique to BFC have not been clearly established in the literature though the general implication belief exists that involvement of larger lung surface areas leads to increased mortality [5,6]. Rib fractures are common among trauma patients and are seen in 10-40% of trauma admissions however the incidence of flail chest however is significantly lower, representing only 1% of blunt trauma. Some studies suggest that increasing age is a risk factor for the development of flail chest after a traumatic event [7,8]. Flail chest patients often present following a motor vehicle crash (MVC) or a fall from height . The etiology of BFC, however, has not been well described in the literature. One study that reviewed the national trauma registry did report 34 incidences of BFC over a period of 60 months, which accounted for 13% of all flail chest cases . Flail chests rarely occur in isolation; 90% of all reported cases have an associated injury, most frequently pulmonary contusion [9,10]. Pulmonary contusions have been identified in up to 80% of patients who underwent preoperative CT scan after sustaining multiple rib fractures . Fractured ribs also pose a potential threat to the lungs as they can produce laceration of the lung parenchyma and subsequent hemo/pneumothorax [8,12]. Traumatic brain injury (TBI) and spinal fractures, especially those involving the thoracic spine, have been observed in these patients as well [10,12]. There is no documented incidence for associated injuries that specifically occur in the setting of BFC. Historically, flail chest was treated with external stabilization techniques, such as strapping [3,4,13]. This idea was described by Malgaigne as early as 1859 where the use of a “body-bandage, or a towel folded twice or thrice, surrounding the chest and fastened with three or four pins” was noted in his publication “A Treatise on Fractures” . This approach remained popular until Avery described the concept of “pneumatic stabilization” in 1956, which corresponded to the advances made in ventilator technology at that time [4,13]. By 1975, it became increasingly evident that effective pulmonary hygiene and the aggressive treatment of often-associated pulmonary contusions were essential to a successful outcome in flail chest injuries . Since then, the concept of mandatory mechanical ventilation has been abandoned in favor of selective methodology. However when a patient presents with flail chest in the presence of associated head injuries, endotracheal intubation may be required [3, 11]. In flail chest, ventilation has been shown to reduce atelectasis and facilitate removal of airway secretions . In addition, thoracostomy tubes are frequently required due to associated of hemo and/or pneumothorax. In one study, 77% of flail chest patients required chest tube placement while 14% required bilateral chest tube insertion . Over the past two decades, conservative treatment has been utilized as the mainstay of treatment for flail chest injury, though much of the recent literature regarding this injury pattern suggests that surgical intervention may reduce the number of hospital days, the duration of mechanical ventilation, and rate of associated complications [15,16]. The preferred surgical technique as surveyed by Mayberry is stabilization with metal plates secured with bicortical screws. Other reported methods include the use of metal plates secured with wire cerclage, intramedullary wire fixation, absorbable plates secured with bicortical screws or suture cerclage, external fixation, and Judet struts . In the presence of mounting evidence to support operative intervention, surgical repair for rib fractures has been described as “likely underused” . A survey of trauma surgeons, orthopedic trauma surgeons, and general thoracic surgeons revealed that only 26% of respondents had either assisted or were the primary surgeon involved in a rib fracture repair . When asked about the role of rib fixation in the setting of flail chest, only 8% favored surgical repair in patients not requiring mechanical ventilation and 34% preferred operative repair in those unable to be weaned from mechanical ventilation after 7 days . There is little information provided in the literature regarding specific treatment of BFC injuries. Of the data currently available, only anecdotes from larger studies and cases reports are available. In a study of 66 patients with flail chest who underwent surgical stabilization, six had BFC; three had bilateral fixation, and the remaining three had unilateral fixation. Specifically, the three patients who had bilateral anterolateral flail chest received bilateral fixation through a transverse sub-mammary approach. The other three patients had unilateral repair of an anterolateral flail chest while the contralateral side with posterolateral displacement was treated conservatively . Despite this, outcomes regarding morbidity or mortality of either group were not reported. Kim reported one case of bilateral flail chest that was successfully managed by a Nuss procedure using the Park method . The Nuss procedure, originally described in 1998, involves the insertion of a convex steel bar through a small lateral thoracic incision, which allows for correction of pectus excavatum without rib incision or resection . The “Park method” is a modification of the Nuss procedure centered around the elevation of the deepest point of depression rather than the center of the sternum . In this case, the patient was successfully weaned from the ventilator on post-op day one and subsequently had an uneventful hospital course. The authors of this case report that the Nuss procedure is an option for patients with severe BFC with concurrent pectus excavatum . Another case of BFC, occurring alongside an unstable T9 hyperextension injury, was reported by Bailey . After initial stabilization and control of thoracic pain with epidural anesthesia, the patient underwent fixation of bilateral clavicle fractures, sternal fractures and a T9 fracture to stabilize the thoracic cage; rib plating, however, was not performed. The patient was readmitted with an empyema three weeks after discharge but fully recovered after a video-assisted pleural decortication . Kilic reported a series of 23 patients with flail chest . Ten patients had “bilateral costochondral disruption” although it is unclear if all ten had BFC. In this series, three patients underwent internal fixation and thoracotomy to control pulmonary or intercostal hemorrhage, however it was not identified if those patients had unilateral or bilateral flail chest . It has also been suggested by some authors that surgical stabilization should be avoided in patients with severe pulmonary contusions, as the underlying lung injury and respiratory failure will prohibit early weaning of mechanical ventilation [8,11]. Complications, specifically those involving the pulmonary system, are commonly found in association with flail chest injuries and are well documented in the literature. For example, prolonged ventilatory support is associated with an increased risk of pneumonia . Another study cited flail chest and bilateral rib fractures as factors that increased the risk of developing pulmonary complications including pneumonia, respiratory failure, and need for tracheostomy . This risk can be reduced to a certain degree by effective pulmonary toilet, which may include the use of flexible bronchoscopy . Cases of empyema have also been reported in this patient population and are likely related to a retained hemothorax . Other case reports cite formation of lung pseudocysts, though this may not be a sequelae of flail chest but instead a result of this may be due to the initial traumatic event and not as a sequelae of the flail chest itself . In Lardinois study, patients who underwent surgical stabilization experienced a complication rate of 18% . In this series, in addition to pulmonary complications there were three cases of acalculous cholecystitis, two cases of myocardial infarction, and two cases of wound infection that required re-operation . The rate of complications in patients with BFC however is unknown – available studies do not specify whether complications occurred in patients with unilateral or bilateral flail chest. In a study from the national trauma registry, Borman found a the mortality rate of for flail chest patients to be 21% in flail chest patients [7,11]. In his series, several prognostic factors demonstrated correlation between flail chest injury mortality; for example, anterior flail chest had a higher associated rate of mortality compared to lateral flail chest. This is likely because anterior flail chest has the potential to affect both lung parenchyma, producing a larger area of contusion [6,8]. It has also been demonstrated that increased injury severity score (ISS), increased age, and flail chest occurring in the setting of head trauma, are also associated with an increased mortality [7,8]. The need for chest tube placement has been shown to increase the requirement for ventilator support, but was not shown to increase in mortality . According to the available literature, BFC is associated with a 50% mortality rate [6,7]. BFC by definition is the requires the presence of severe injury to the thoracic cage, which is often accompanied by significant associated injuries . It is the presence of these associated injuries that are often responsible for the majority of deaths in flail chest patients . Compared to other aspects of flail chest, return of pulmonary function has been frequently studied. Operative intervention does not guarantee improvement of pulmonary function following stabilization with reconstructive plates . Anterolateral dislocations are more prone to developing late restriction and pseudoarthosis, which may compromise pulmonary function . Pulmonary function within six months is possible in patients without extensive pulmonary contusions despite having residual chest wall deformity . Those with pulmonary contusions however, have prolonged impairment of functional residual capacity . The long-term morbidity in patients sustaining significant rib fractures includes pain, disability, and deformity of the chest wall . Decreased quality of life, made evident through return-to-work rates as low as 40% and significant reduction of function present in 60% of patients at 24 months, highlight that although this is often studied as an acute condition, the ramifications of rib fractures and flail chest carry long-term consequences [1,23,24]. Pain and disability experienced by the patient at 8 weeks post-injury have been correlated with intensity of pain experienced during the first few days after the injury . In one study measuring functional outcome of patients sustaining flail chest, shoulder girdle function was symmetric in 90% of flail chest patients at 6 months follow up. However, for patients with co-existing shoulder girdle or brachial plexus injuries, long term shoulder function was impaired. Shoulder abduction was limited to an average of 100 degrees in the ipsilateral shoulder for this subset of patients . While bilateral rib fractures are predictive of chronic disability, the presence of flail chest is not . There is no specific information about the long term prognosis of patients sustaining bilateral flail chest in particular. Flail chest contributes a significant portion of morbidity and mortality in patients sustaining blunt thoracic trauma. Current literature favors the use of early operative intervention to stabilize the flail segment, however prospective randomized controlled trials to support this recommendation are unavailable. In particular, lack of literature regarding the treatment and outcome of bilateral flail chest emphasizes the fact that this type of injury is significantly under-reported and understudied. Operative intervention has been utilized in the few cases of BFC noted in the literature, however there is insufficient evidence to reach meaningful conclusions. Further work is needed to determine optimal treatment for these patients. 1. Marasco S. Quality of life after major trauma with multiple rib fractures. Injury. 2015;46(1):61. 2. Avery E, Benson. DW, Morch ET. Critically crushed chests; a new method of treatment with continuous mechanical hyperventilation to produce alkalotic apnea and internal pneumatic stabilization. Journal of Thoracic Surgery. 1956;32(3):291-311. 3. Cannon RM, Smith JW, Franklin GA, Harbrecht BG, Miller FB, Richardson JD. Flail chest injury: Are we making any progress? Am Surg. 2012;78(4):398-402. 4. Trinkle JK, Richardson JD, Franz JL, Grover FL, Arom KV, Holmstrom FMG. Management of flail chest without mechanical ventilation. Ann Thorac Surg. 1975;19(4):355-363. 5. Kim JJ. Nuss procedure for severe flail chest after blunt trauma. The annals of thoracic surgery. 2015;99(2):e25. 6. Huber S. Predictors of poor outcomes after significant chest trauma in multiply injured patients%253A a retrospective analysis from the german trauma registry (trauma register DGU (R)). Scandinavian journal of trauma, resuscitation and emergency medicine. 2014;22. 7. Borman JB, Aharonson-Daniel L, Savitsky B, Peleg K. Unilateral flail chest is seldom a lethal injury. Emergency Medicine Journal : EMJ. 2006;23(12):903. 8. Kilic D. Factors affecting morbidity and mortality in flail chest: Comparison of anterior and lateral location. The thoracic and cardiovascular surgeon. 2011;59(1):45. 9. Chapman BC, Herbert B, Rodil M, et al. RibScore: A novel radiographic score based on fracture pattern that predicts pneumonia, respiratory failure, and tracheostomy. J Trauma Acute Care Surg. 2016;80(1):95-101. 10. DeFreest L. Open reduction and internal fixation of rib fractures in polytrauma patients with flail chest. The American journal of surgery. 2016;211(4):761. 11. Lardinois D. Pulmonary function testing after operative stabilisation of the chest wall for flail chest. European journal of cardio-thoracic surgery. 2001;20(3):496. 12. Bailey J. Thoracic hyperextension injury with complete bony disruption of the thoracic cage: Case report of a potentially life-threatening injury. World journal of emergency surgery :. 2012;7:14. 13. Freedland M, Wilson RF, Bender JS, Levison MA. The management of flail chest injury: Factors affecting outcome. J Trauma. 1990;30(12):1460-1468. 14. Malgaigne JF. Treatise on fractures. Philadelphia: J.B. Lippincott & Co.; 1859. 15. Zhang Y, Tang X, Xie H, Wang RL. Comparison of surgical fixation and nonsurgical management of flail chest and pulmonary contusion. Am J Emerg Med. 2015;33(7):937-940. 16. Slobogean GP. Surgical fixation vs nonoperative management of flail chest: A meta-analysis. Journal of the American College of Surgeons. 2013;216(2):302. 17. Mayberry C, J., Ham B, L., Schipper H, P., Ellis J, T., Mullins J, R. Surveyed opinion of american trauma, orthopedic, and thoracic surgeons on rib and sternal fracture repair. The Journal of Trauma: Injury, Infection, and Critical Care. 2009;66(3):875-879. 18. Richardson JD, Franklin GA, Heffley S, Seligson D. Operative fixation of chest wall fractures: An underused procedure? Am Surg. 2007;73(6):591-596. 19. Nuss D, Kelly RE, Croitoru DP, Katz ME. A 10- year review of a minimally invasive technique for the correction of pectus excavatum. J Pediatr Surg. 1998;33(4):545-552. 20. Park HJ, Lee SY, Lee CS, Youm W, Lee KR. The nuss procedure for pectus excavatum: Evolution of techniques and early results on 322 patients. Ann Thorac Surg. 2004;77(1):289-295. 21. Voutsas V. Post-traumatic lung pseudocysts: A two case reports in ICU patients. Journal of thoracic disease. 2012;4:74. 22. Kishikawa M, Yoshioka T, Shimazu T, Sugimoto H, Yoshioka T, Sugimoto T. Pulmonary contusion causes long-term respiratory dysfunction with decreased functional residual capacity. Journal of Trauma. 1991;31(9):1203. 23. 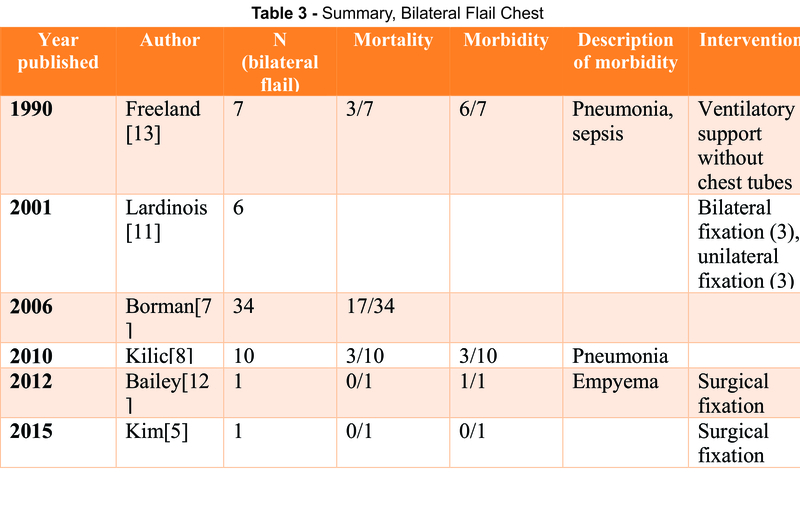 Battle CE, Evans PA. Predictors of mortality in patients with flail chest: A systematic review. Emerg Med J. 2015;32(12):961-965. 24. Landercasper J, Cogbill T, Lindesmith L. Long term disability after flail chest. J Trauma. 1984;25(5):410-4. 25. Fabricant L, Ham B, Mullins R, Mayberry J. Prolonged pain and disability are common after rib fractures. Am J Surg. 2013;205(5):511-515. 26. Gordy S. The contribution of rib fractures to chronic pain and disability. The American journal of surgery. 2014;207(5):659. How to Cite this article: Phillips B, Murray E, Holzmer S . Bilateral Flail Chest: A review. Journal of Trauma and Orthopaedic Surgery.April – June 2017;12(2):2-7.
bilateral flail chest; blunt thoracic trauma; rib fracture; serial rib fractures.